IT managers seem to be hesitant to adopt OSS in the absence of professional support. Previous qualitative studies have indeed suggested that the availability of external support is important for the adoption of OSS. Therefore, we feel it is interesting to gain more insight into the role of external support in the adoption process. To this end, we performed a web survey involving 95 Belgian organizations. Our data suggests a balanced picture. As expected, our results show that the majority of organizations in our sample rely on commercial support such as vendor or third party support. Even organizations that have deployed OSS to a large extent—and that are therefore likely to have some experience and familiarity with OSS—rely on commercial support. Nevertheless, a considerable proportion of organizations indicated not to rely on commercial support, which suggests that internal expertise can be sufficient for successful adoption. 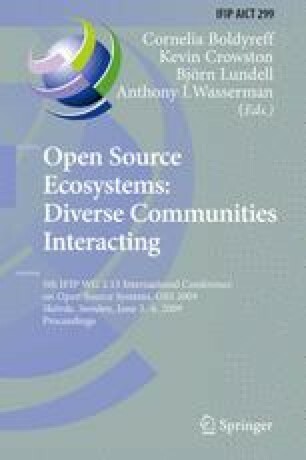 Finally, and most surprisingly, we have found that the OSS community is used by a large proportion of organizations. This indicates that the OSS community is a valuable source of external support for organizations. Nevertheless, it appears that it is primarily used by organizations with a rather strong background in IT.